Yesterday, Defra announced the maximum on-the-spot fine local authorities can issue for dropping litter will nearly double, from £80 to £150. For the first time, local authorities will also be able to apply these penalties for littering to vehicle owners if it can be proved litter was thrown from their car. This announcement received positive coverage in The Times, Mirror, Express and the Telegraph. This was also welcomed by organisations such as the Local Government Association as a “hugely positive step in the right direction”. Littering blights our communities, spoils our countryside and taxpayers’ money is wasted cleaning it up. Throwing rubbish from a vehicle is just as unacceptable as dropping it in the street and we will tackle this antisocial behaviour by hitting litter louts in the pocket. These new fines will make sure the perpetrators, not the local community, bear the cost of keeping our streets and roads clean. Secretary of State Michael Gove this week took the chance to highlight the state of the country’s soils in a speech to industry stakeholders. The Soils in Crisis Parliamentary Reception was covered by the Times, Guardian and Telegraph which centred on warnings that the fertility of the ground was in danger if soils were not taken care of. We may be 30, 50, 60 harvests away - years away - from the fundamental eradication of fertility, in parts of our country. We know we need to go further in order to ensure our most important of natural resources, and the capacity of the earth to renew itself to provide us with food and so much more, is restored. That’s why we are taking steps in order to return our soils to good health. 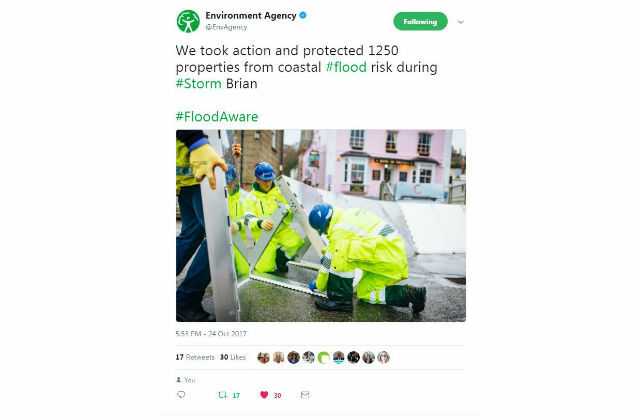 The Environment Agency protected 1250 properties during Storm Brian. Environment Agency teams were on the ground, checking defences and taking precautionary action to close tidal gates and put up temporary barriers. They also worked closely with the Met Office and local authorities. Since 2016, the EA has invested £12.5 million in new kit to improve our flood response - and now has 40km of temporary barriers and 250 high volume pumps, stored around the country that can be moved to where they are most needed in a flood. We urge people to stay safe along the coast and warn people against putting themselves in unnecessary danger by taking ‘storm selfies’ or driving through flood water – just 30cm is enough to move a car. You can check whether you’re affected by flooding at www.gov.uk/flood. Flood alerts and warnings will be issued as needed, so we encourage everyone to sign up to receive them for free online or by calling 0345 988 1188. The European Commission Standing Committee on Plants, Animals, Food and Feed met today to discuss whether to renew the licence of glyphosate, the active ingredient of the weedkiller Roundup. The UK government supports the continuing approval of glyphosate. However not enough countries voted for the extension to reach a qualified majority which means an outcome was not reached. The government is disappointed that a vote did not take place today leaving our farmers and gardeners still waiting for certainty regarding their future access to glyphosate. Outside of the EU we will be free to make our own decisions on pesticides which will be taken based on the best available science.